BRUSSELS (Reuters) - Marine Le Pen's far right National Front scored a stunning first victory in European Parliament elections in France on Sunday as critics of the European Union registered a continent-wide protest vote against austerity and mass unemployment. Without waiting for the final result, French Prime Minister Manuel Valls went on television to call the breakthrough by the anti-immigration, anti-euro party in one of the EU's founding nations "an earthquake" for France and Europe. Anti-establishment far right and hard left parties, their scores magnified by another low turnout, gained ground in many countries although in Germany, the EU's biggest member state with the largest number of seats, the pro-European center ground held firm, according to exit polls. A jubilant Le Pen, whose party beat President Francois Hollande's ruling Socialists into third place, told supporters: "The people have spoken loud and clear... they no longer want to be led by those outside our borders, by EU commissioners and technocrats who are unelected. "They want to be protected from globalization and take back the reins of their destiny." The National Front was set to win more than 25 percent of the vote, comfortably ahead of the conservative opposition UMP on 21 percent, with the Socialists on 14.5 percent, their second defeat in two months after losing dozens of town halls in March. First official results from around the 28-nation bloc showed the pro-European center-left and center-right parties will keep control of the 751-seat EU legislature, but the number of Eurosceptic members will more than double. The center-right European People's Party, led by former Luxembourg Prime Minister Jean-Claude Juncker, was on track to win 212 seats, preliminary results issued by the parliament showed. 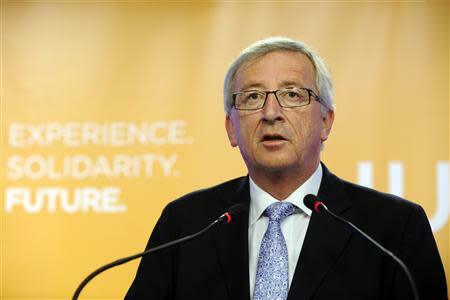 "We did win the elections," Juncker told reporters, saying his party had earned the right to head the executive European Commission. The center-left Socialists led by outgoing European Parliament President Martin Schulz of Germany were in second place with 185 seats followed by the centrist liberals on 71 and the Greens 55. 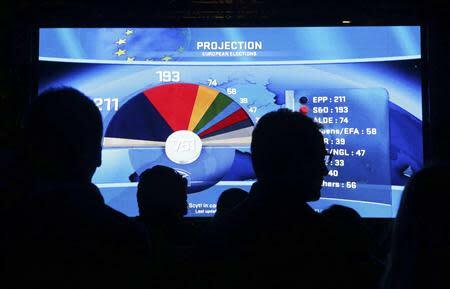 Eurosceptic groups were expected to win about 143 seats, and the far left another 45. A glum looking Schulz was not conceding defeat, telling reporters he was open to negotiations with other parties. The political fallout may be felt more strongly in national politics than at EU level, pulling mainstream conservative parties further to the right and raising pressure to crack down on immigration. The anti-EU UK Independence Party led by populist Nigel Farage scored major gains and was leading the opposition Labour party and Prime Minister David Cameron's Conservatives in early results from Britain, where voting took place last Thursday. That will pile pressure on Cameron, who has promised Britons an in/out referendum on EU membership in 2017 if he is re-elected next year, to take an even tougher line in Europe. "The whole European project has been a lie," Farage said on a television link-up with Brussels. "I don't just want Britain to leave the European Union, I want Europe to leave the European Union." In Italy, Prime Minister Matteo Renzi's center-left Democratic Party was holding off a strong challenge from the anti-establishment 5-Star Movement of former comic Beppe Grillo, according to a first exit poll of uncertain reliability. Denmark's anti-immigration far right People's Party was set to top the poll with an estimated 23 percent and the extreme-right Jobbik, widely accused of racism and anti-Semitism, was running second in Hungary with 15 percent. In the Netherlands, the anti-Islam, Eurosceptic Dutch Freedom Party of Geert Wilders' - which plans to forge an alliance with Le Pen - finished joint second in terms of European Parliament seats behind a pro-European centrist opposition party. 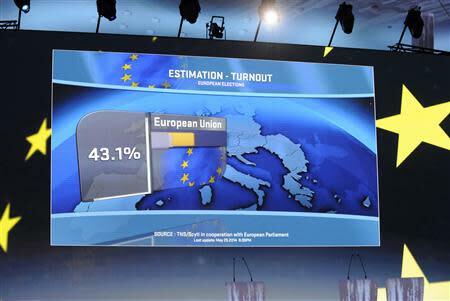 Although 388 million Europeans were eligible to vote, less than half that number cast ballots. Average turnout was officially estimated at 43.1 percent, barely higher than the 2009 nadir of 43.0 percent, despite efforts to personalize the election with all the mainstream political families putting forward a leading candidate or "Spitzenkandidat". In Germany, Chancellor Angela Merkel's Christian Democrats were set to secure 36 percent of the vote, down from a 23-year-high of 41.5 percent in last year's federal election but still a clear victory. The center-left Social Democrats, her coalition partners, were forecast to take 27.5 percent. party created only last year. "Germany has cast a clear pro-Europe vote and the high turnout is a good signal for the idea of European unity," said David McAllister, the top Christian Democrat candidate. It was a different story in Greece, epicenter of the euro zone's debt crisis, where the radical left anti-austerity Syriza movement of Alexis Tsipras was set to win with 26.7 percent, pushing governing New Democracy into second place on 22.8 percent. That reflected popular anger at harsh spending cuts the government has adopted in recent years to meet the terms of its EU/IMF bailout program. The surge in support for the far left raises doubts about how much longer the coalition government can last with a parliamentary majority of just two seats, although government spokesman Simos Kedikoglou said it would endure. "The political scenario of a government collapse, which Syriza was trying to paint, has not been borne out by the facts," he told Greek television. The two parties in the coalition, New Democracy and PASOK, won a combined vote larger than that of Syriza. Sunday was the fourth and final day of voting in elections to the European Parliament, which is an equal co-legislator with member states on most EU laws. Far-right and radical left groups were expected to secure up to a quarter of the seats, enough to gain a much louder voice but probably not to block EU legislation. Officials said final results and seat allotments would likely not be finalized until later on Monday. The record low turnout was in Slovakia, with just 13 percent. The highest was 90 percent in Belgium, where voting is compulsory and there was a general election on the same day. Sweden appeared to have elected the only feminist party member of the EU assembly.